The Toolbox contains all of the area selection modes and modifiers for the program. An area select defines where the operation will occur. F/x's area selection mechanism can work in one of two ways. Choosing the active method can be done using the keyboard (using I and D when an image window has the mouse focus) or via the dialog available from the menu selection Settings / Change Working Method. Select an operation by clicking and holding the left mouse button while over its icon. Drag this icon to the TimeLine, and place it in the desired frame location. This technique of selecting and placing the operation in the TimeLine is known as Drag and Drop. Select the area selection for the operation using the same Drag and Drop method. Choose the appropriate settings for this operation (see the Timeline section for more information). Select Generate to create the animation. Select the operation that you would like to apply to the current area selection by left clicking the mouse on the operation's icon. F/x will automatically apply the operation with the current settings in the specified region. These settings can be changed prior to application by right clicking on the operation icon, and then altering the settings to the desired values. After the proper values have been set, you may left click on the icon to carry out the operation in the selected region. A new operation can then be applied to the same region by left clicking on the operation icon, or a new are can be selected by following the steps above for each new area. F/x uses a native modal area selection method. This means that every area selection tool is maintained as the current mode until changed by the user. An area selection mode or modifier is selected by left clicking on the desired mode's icon. This will cause the icon to look like it has been pressed into the Toolbox. At this point all area selections made on any image view will use the selected area mode and any associated modifiers. Some area selection modes have specific settings associated with them (i.e. Rounded Rectangle). These extra settings or controls can be accessed through the Area pull down menu, or by right clicking over the area selection mode's icon. This will cause F/x to bring up the appropriate controls for that area mode. After you have made the desired changes, you may select OK, and then continue making area selections. Each of the area selection modes is used in the same relative manner. For most of the area selection methods the left mouse button sizes the area and the left and right mouse buttons pressed together move the area selection. Both Working Methods (Immediate Painting and Draw First) can have area selections added to or subtracted from the original area. Areas may be added by holding SHIFT while making the area selection, and areas may be subtracted from the area selection by holding CTRL while making the area selection. This allows you significant freedom in creating complex area selections in an image. There are two types of area selection devices in F/x. The first is an area selection tool or mode. The area selection tools allow you to specify where the current operation is to be applied. These tools include: Freehand, Polygon, IShapes, Rectangle, Rounded Rectangle, Ellipse, Polyarc, Spline, Numeric Rectangle, Color Wand, Bezier Curve, and the Entire Image. These tools can be altered through use of the area selection modifiers. The modifiers are: Color Key, Splatter, Exclusive Or, Intersection, Union, Hold Aspect Square, Exclude or Complement, and Hold Aspect to Image (Action or Source). These modifiers can be applied to the various tools to create new and unusual areas for application of the many operations. F/x allows you to specify a specific transparency or alpha channel for each area selection in addition to the image's alpha channel. The transparency can be set prior to making the area selection, or by editing the transparency values in the Area Selection Detail dialog if the area has already been placed into the TimeLine. The transparency dialog can be accessed prior to making an area selection by pressing F3, or by selecting the Transparency Controls option from the Area pull down menu. The sections below discuss the various transparency dialog controls, and their effect on an area selection. The Transparency controls are used to specify the amount of transparency and the edge blending level for an area selection. The Transparency is the amount that a source, alpha channel, or even an effect will show through the current or Action Image. The edge blending percentage is the amount of allowable blending on the edge of the area select. The Transparency level slider allows you to specify the transparency as a value that ranges between 0 and 255. A setting of 0 will result in the effect being completely transparent, and a setting of 255 will make the effect opaque. The specified transparency level can be applied to all of the effects in F/x. The Edge Blending control allows you to specify the percentage value of the entire area select that is to be used for edge blending. The control can range from 0% to 100%, and affects the horizontal slope of the graph. A setting of 0% will result in there being no edge blending, and a setting of 100% will result in an edge blend that extends from the edge of the area select to the center. You can also perform an anti-aliasing operation by setting this control to 1%. This setting will not perform a true edge blend. There are several preset edge blending levels. These presets are: Flat, Soft Edges, Broad Edge Fade, and Conical Fade. The Flat preset has an edge blending percentage of 0% which will simply place the effect in the selected area with no blending. Soft Edges will perform an anti-aliasing at the edge of the area select. 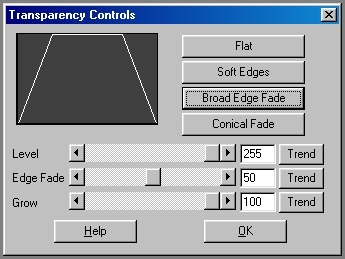 The Broad Edge Fade has an edge blending level of 50% that produces a nice fading effect. Conical Fade has 100% edge blending. This dialog also contains a control to alter the width of the area selection. This means that you can specify exactly where the edge blending is to begin. The control ranges from 0 to 100%, and affects the width of the transparency graph. For example, a setting of 50% would result in the edge blending beginning 50% into the area selection. It is important to remember that image information outside of this radius will be lost. There are also TimeLine-relative trend graphs for each of these transparency modifiers. Setting the trends for an operations will allow you to create effects that fade in and then fade out or even transitions from one image to another. The trend button allows you to set that variable over a set of frames. Each frame of the animation can be thought of as a slice of time. The trends allow you to alter some, all, or none of the variables for a particular time slice. You will notice that the trend graphs have equidistantly spaced vertical lines. Each of these lines represents a frame in the animation. The number of frames can be altered using the Sequence controls... in the Timeline pull down menu. Refer to the picture of the Toolbox at the right for a quick reference as to which area tools can generate paths. Paths in F/x are used in two main roles; as area selection initializers for the Particle System operator, and as paths for the Stroke operator. The Unclosed Area button at the bottom row, center, in the area toolbox affects how paths are generated, as does the corresponding menu item in the Area menu. Plug-ins may take advantage of paths; this depends on the design of the plug-in. Tip: If you use the freehand tool to generate paths, you should move the mouse (or pen, or trackball, etc.) slowly and precisely in order that Windows provides the highest quality tracking of the shape you are drawing. If you move the pointing device too quickly, the track will consist of straight segments between the points that the operating system sends to F/x.